Previous awarded Best Red Wine for two years by the public at Winex in Cape Town and Johannesburg. Dark and juicy with plenty of rich damson and baked plums, a hint of coffee on the nose and soft tannins. This wine boasts a distinct nose of coffee, rich dark chocolate and baked plums. The ripe subtle tannins create a wine to be drunk very young. 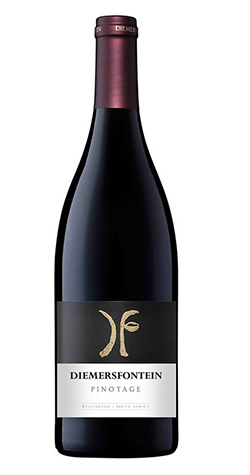 This unique style of Pinotage is a perfect accompaniment to salmon, roast venison and even chocolate mouse, and seems to be a wonderful introduction for Americans to the world of Pinotage. Grapes were sourced from six farms in Wellington area, each farm with its own terroir, bringing something unique to the blend. After harvesting cold soaking took place for 12 hours. Inoculated with yeast and aerated pump overs every 3 hours for 25 minutes to extract sufficient colour, tannin and aroma. Pressed at 2.5° B and completed alcoholic fermentation on French oak inserstave. Malolactic fermentation on primary lease and staves. Racked after malolactic fermentation and put back on oak staves for 6 Months. Bottled beginning of September. Diemersfontein wine estate is situated in Wellington, Western Cape and lies in the shadow of the beautiful Hawekwa Mountain with a panoramic view of Du Toit’s Kloof and Bains’ Kloof. It has been in the Sonnenberg family since the early 1940’s, when owner Dave Sonnenberg’s grandfather bought the 183 hectare farm. Over the years it has been used as a tranquil country retreat for the family and during the war, Italian prisoners of war were housed in the cottages. The first vineyards were planted in the 1970’s and in 2000 David build a cellar and started producing award-winning wines. Varietals planted are Shiraz, Pinotage, Cabernet Sauvignon, Merlot, Viognier, Barbera, Roobernet and Mourvedre. The first trophy was one in 2001 for a wooded Pinotage, and from then on accolades and awards are continuing to be granted to the Estate. Black Empowerment also plays a role on this estate, and the owners have warmly embraced the BEE (Black Economic Empowerment) policies of the government. The estate makes a contribution towards the development of their employees, both from a family wealth as well as the development of skills by allowing them to make use of the facilities and resources of Diemersfontein to produce their very own range. They develop independence of the “parent” company and have the ability to function and grow in the broader economy.